A lovely friend sent me a link last night to a whole stack of delicious Raw Desserts! I had to immediately get to work and start making them. In a food processor, mill the oats until they are flour like. Add remaining ingredients and process until all ingredients are well combined. Takes a few pulses. The mixture is quite sticky so you may need to employ a metal spoon to assist with press into a lined square container. I like a good fat looking brownie, so I have used a square 12cm plastic container as my ‘brownie’ pan. Once you have your mixture flattened into a container – place in the fridge for 1/2 hour. 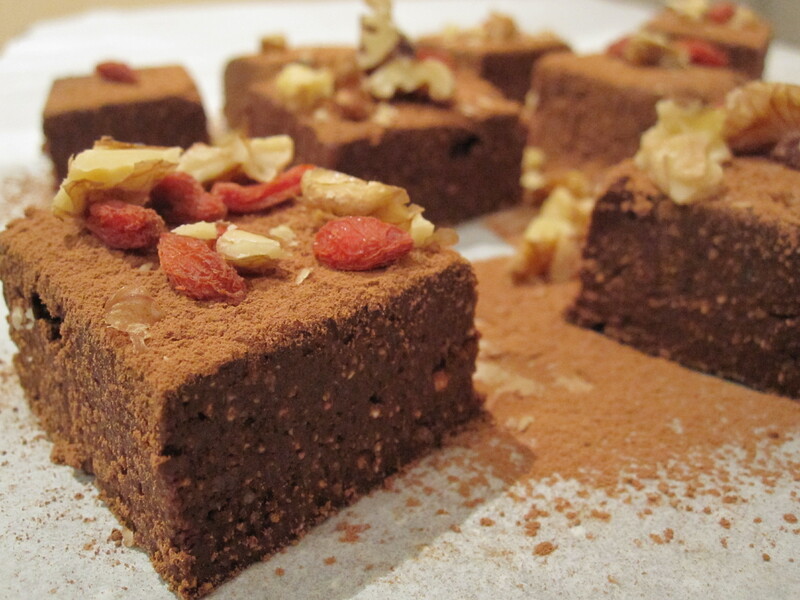 Serve with a sprinkle of cacao and some chopped nuts – or just how you please. Hey Ally, where do you get your vanilla bean paste from?